To promote interest, enthusiasm, and improvement in track and cross-country in Northern Illinois. To provide education and opportunity for involvement for every coach in our association by methodology. We also strive to bring in outstanding coaches and athletes from the college ranks. To promote, publicize, and recognize achievement of our area athletes and coaches. To request the feelings of schools, coaches, and athletes of our area on rule changes, administration of track and cross-country meets to the IHSA. We strive to provide a voice representing the needs and interests of Northern Illinois in any decisions regarding track and cross-country in the state of Illinois. To work with and generally support the Illinois High School Association. ITCCCA-N is a Non-Profit Organization The monies raised by the association help pay for the All-State Cross Country and Track Awards, the Coach of the Year, Hall of Fame, Pasquini Asst. Coach Award, Distinguished Service Award. Athlete of the Year, ITCCCA-N also awards the George Dekan scholarship and picks up all expenses at the Mid-East Cross Country Meet. ITCCCA-N sponsors two clinics each year: The January clinic for all coaches and the Jr. High ‘Learn by Doing’ clinic in March. ITCCCA North Division Boundaries All parts of Illinois north of a line running South of Galesburg, and North of Pontiac. ITCCCA North All-State Cross Country Team –To qualify the runners must attend a school which is located in ITCCCA (North Division) boundaries. As determined by the IHSA results, the top 25 boys and top 25 girls regardless of class from ITCCCA-N division schools from each class will receive recognition. ITCCCA North All-State Track & Field Team – The top three performances regardless of class by athletes from the North Division in the IHSA State Track Meet, will receive a certificate. These awards will be distributed at the Fall Meeting. The members of the top 3 relays regardless of class, will also, receive certificates. 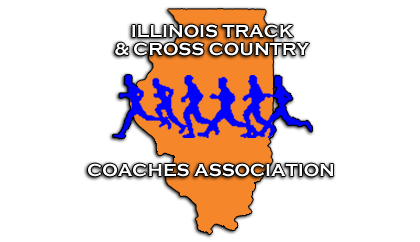 ITCCCA North Athlete of the Year- Illinois track & Cross Country Coaches Association awards Athlete of the Year to honor Illinois Track & Cross Country Athletes who have demonstrated remarkable achievements that are in the North ITCCCA boundaries. At least three males & three females will receive this award annually. Plaques will be awarded in the categories of: sprints, field, and distance. The recipients are selected by a committee of coaches and media who are members of the track & field and cross country community. ITCCCA North Dave Pasquini Career Assistant Coach Award – This award should be considered for those assistant coaches in Track or Cross Country In ITCCCA North who have demonstrated their expertise over the life of their careers. The nominee must have a minimum of 10 years as an assistant coach (the years do not need to be at the same school). The Head Coach nominates the assistant coach. Hall of Fame coaches are not eligible to win this award. There will be a maximum of five awards given each year. This is a once in a career award. ITCCCA North George Dekan Scholarship – This $1,000 scholarship is awarded to at least two Senior Track & Field or Cross Country athletes in the ITCCCA North boundaries. Many years have seen four athletes receive the award. There is a form to fill out and an essay to written. This form is available on the ITCCCA web site. ITCCCA Hall of Fame – Established in 1977 to honor men and women who have made a significant contribution to the sports of Track & Field and Cross Country in the State Of Illinois. In order to receive consideration of the Hall of Fame Executive Committee, the candidate must have coached for at least 20 years in Track & Field and /or Cross Country, and some of those years must have been in Illinois. A permanent Hall-of-Fame Committee, headed by Steve Currins and Bruce Ritter, and composed of at least 12 Hall-of-Fame Coaches, meets each October to elect a maximum of seven new members. If a candidate is not selected the first year their name remains in nomination for five years. After five years, the candidate may be re-nominated for consideration. ITCCCA North Distinguished Service Award – Established in 1992 to honor men and women who are neither coaches nor athletes but who have made a significant contribution to the sports of Track & Field and/or Cross Country in the State of Illinois. There is no minimum number of years of candidates each year. Candidates could include, but not be limited to: officials, reporters, athletic directors & physicians. ITCCCA Officers – The President & Vice President serve two-year terms, with the Vice-President serving as President Elect. Mid-East Cross Country Championships – Traditionally held in Kettering, Ohio, either 1 or 2 weeks after the IHSA State Cross Country Meet. This Meet features the finest senior boys and girls from Ohio, Indiana, Michigan, and Illinois. Selections will be based on results of the IHSA State Cross Country Meet. ITCCCA Fall Coaches Meeting – Traditionally held in September. ITCCCA Jr. High ‘Learn-By-Doing’ Clinic – Traditionally held on Sunday in the middle of March at Wheaton North H.S.